Out of Stock - Pr. . .
Pragma's adjustable bed frames are manually adjustable to accommodate a variety of activities such as sleeping, eating, reading, TV-watching, or lounging. State of the art construction offers significant health benefits for lower blood pressure, improved breathing and circulation, and reductions in many forms of pain. 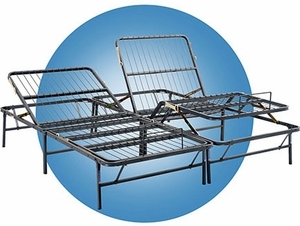 Pragma bed frames are constructed using powder-coated steel for a refined look, and are bedbug and allergen resistant. The DUAL ADJUST bed frame features both a head and foot section that manually adjusts to provide the same comfort and versatility as a conventional electric adjustable bed, but at a fraction of the price. All beds, excluding Twin and Twin XL, consist of two separate frames that are joined with connecting bolts to create the desired bed size. Pragma Bed products are durable, affordable and made with the customer in mind. � State of the art, modern design includes manual, silently operating head and foot adjustments on dual-point frame. � Head section adjusts to 10 different positions; head adjusts to 80� angle. � Sections of split Full/Queen/ King/Cal King beds adjust independently, or together with frame connecting bracket. � Twin/TwinXL sizes withstand up to 1200lbs, Full/Queen/King/Cal King sizes up to 2400 lbs. � Sets up in less than 30 minutes; no tools required. � Powder-coated steel frame and zinc-plated adjusting mechanism. � 13″ clearance under entire frame provides space for available storage bins. � Brackets available for attaching headboard and footboard to frame. IMPORTANT NOTICE: Mattress and outer wood frame not included. Pragma bed frames are drop shipped by the manufacturer via UPS Ground with tracking. Most orders ship out within three business days. Pragma Bed�, a division of the Pragma Corporation guarantees the repair or replacement of your foundation if it becomes unserviceable as a result of any material defect or inadequate workmanship. Please read through the limited warranty guidelines below and register your product by filling out and sending the enclosed warranty registration card. HOW LONG IS THE COVERAGE OF THE LIMITED WARRANTY? The limited warranty coverage begins on the original date of purchase and lasts three years. Repair or replacement of the foundation does not extend its limited warranty or begin a new limited warranty period. The limited warranty is only valid for the original purchaser of the foundation and only covers manufacturing defects for the foundation when it is subject to proper handling and normal use. Proper handling is defined as the foundation�s intended use as a bed frame with all six legs of the frame on a flat, stable, even surface. If a manufacturing defect is discovered with your foundation, please discontinue use of the frame immediately. The limited warranty excludes the following: Structural damage from improper usage; Physical abuse or damage to the structure including, but not limited to, burns, spills, bent or broken border/grid wires; Merchandise sold �as is� or as �floor models�; Transportation, inspection, or removal costs of products; Any attachments or accessories including, but not limited to, headboard/footboard brackets, bed skirts, or mattresses. In the event a warranty claim is filed and the Pragma Bed� product purchased has a confirmed manufacturer�s defect, purchaser will be required to surrender the original product to Pragma Bed� at the time of replacement or repair. Pragma Bed� will not be responsible for any transportation and inspection costs. For the warranty to be valid, the claim must be filed by the original purchaser who must have purchased the Pragma Bed� product from an authorized dealer in the 50 United States or Puerto Rico. The original purchaser must provide a copy of the original store receipt or other sufficient proof of purchase upon filing the claim. In no event shall Pragma Bed� be liable for incidental or consequential damages sustained in connection with any Pragma Bed� product or its use. Some states do not allow an exclusion of consequential damages; therefore this limitation may not apply to you. This warranty gives the original purchaser specific legal rights, and the original purchaser may have other rights, which vary from state to state. Money back on returns notified within 7 days of delivery receipt. Buyer pays all shipping costs. Item(s) must be in unused and returned in original packaging. Return authorization required. Subject to 20% restocking fee.